Perfect for parties, bake sales and more! I have always been a big fan of cupcakes. Not only are they quicker and easier to serve than cake, they can be so fun to decorate too. These cuties are inspired by the proverb attributed to the month of March (‘in like a lion, out like a lamb’) and they are a big hit every time I serve them. Just like my small batch maple-bacon cupcakes, this recipe makes a reasonable amount of treats so they’re likely to get polished off quickly and not tempt you for days afterwards. 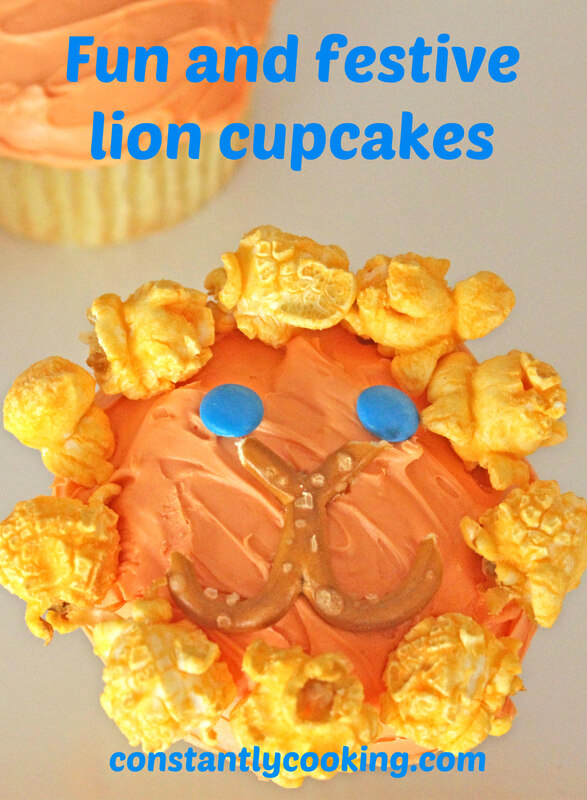 For the lions’ manes, I used Chicago Mix popcorn; some lions were caramel corn, some were cheddar and everyone was happy. To make cupcakes, preheat oven to 350F and line 10 compartments of a muffin pan with paper liners. Divide the batter evenly among 10 muffin cups (fill each about 2/3 full). Bake for 15 – 17 minutes, until a toothpick inserted into the center of a cupcake comes out clean. Cool completely before frosting; if you have time, frozen cupcakes are even easier to decorate. Make the frosting by beating icing sugar and butter together until smooth. Add vanilla extract and 1 tablespoon of milk plus the food colouring. Beat on medium speed until light and fluffy (2 – 3 minutes). If the frosting appears too thick to spread easily, add additional milk as needed, one teaspoon at a time. 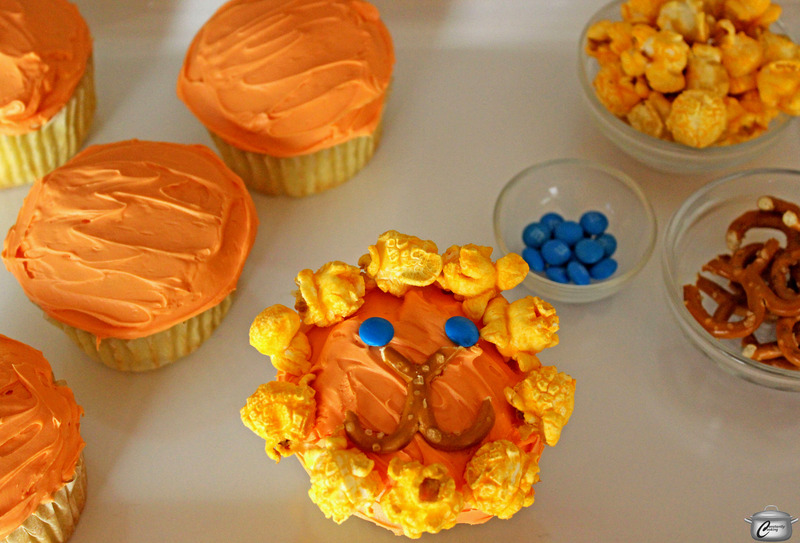 To decorate, trim the domed top off each cupcake with a serrated knife, to make a flat area for the lion’s face. Spread the frosting on the cupcakes with a knife. 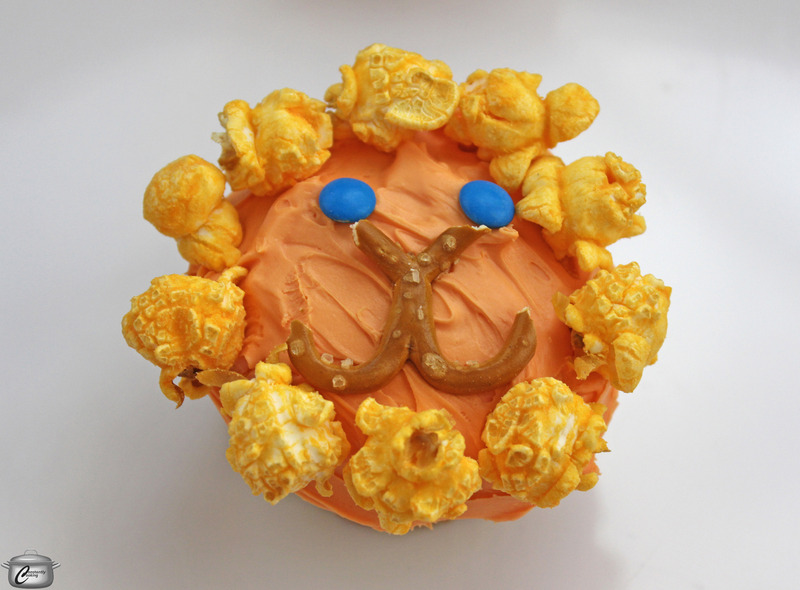 Add eyes and mouth, then place popcorn around the outside to form the mane. This entry was posted in baking, Dessert, Desserts, Entertaining and tagged baking, cupcake, cupcake decorating, festive, March, party, Paula Roy, small batch cupcakes, what to make for a bake sale, what to serve at a birthday party. Bookmark the permalink. Thanks! They are a big hit whenever I serve them (and not just with little kiddos)!